Zentai suits are popular costumes among dancers, acrobats and other theatrical performers. Alternately, they are also used in many situations of adult lifestyle roleplay. 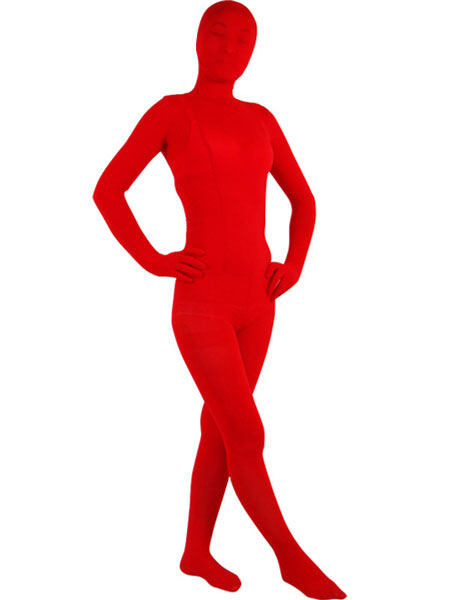 This Zentai suit is made from a luxurious combination of silk and velvet in a daring flame red color. It is an all inclusive Zentai suit, meaning it covers all parts of the body - including the face. This one is unique because it has a slight transparency to it where clothing and facial features show through. I am a performance artist and zentai suits form a really important part of my profession. I have been looking all over the internet for the perfect suits and I must say, there have been none better than what you get here at Milanoo. They are all made of the perfect fabrics and the sizes that are available here are also so varied that you get just about anything that you would be looking for. The best thing however is the price of these which really beats anything and everything else which is available on the internet! Thank you Milanoo! nette Transaktion... gerne wieder und vielen Dank!